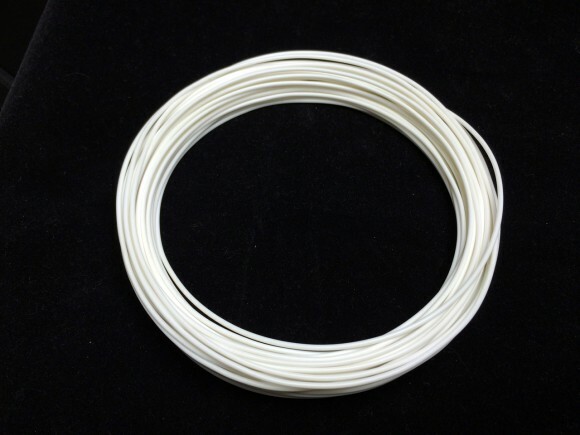 The Biome3D filament for 3D printing is a new material just recently announced, developed by Biome Bioplastics in partnership with 3Dom Filaments – both European companies. The filament is made in 3Dom Filaments facility in Ireland, and is decently priced, especially if you are purchasing it from Europe directly from 3Dom Filaments. Biome3D is a biodegradable thermoplastic that is environmentally friendly – made from plant starches, very safe to work with and virtually odor free according to the manufacturer. 3Dom says that similar to other plant-based plastics on the market (PLA), the thermal and flow characteristics of the Biome3D should allow you to achieve excellent printed detail, with minimal shrinkage, cracking or warping. Since Biome3D filament is still very new there is not that much information about it available and not a lot of people that have reported their printing experience using this material, so we got a short test sample to try it out and see how it compares to other 3D printing materials. 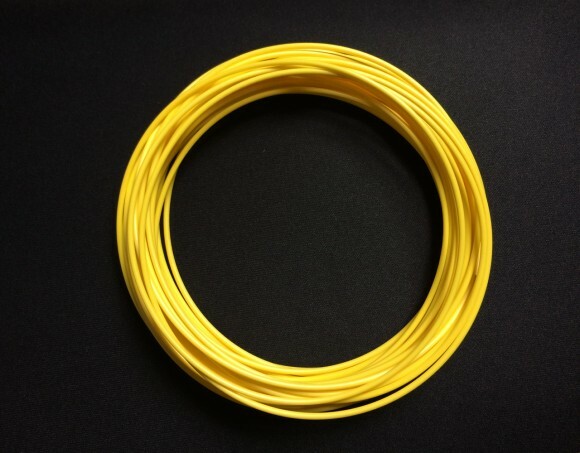 3Dom Filaments recommends Biome3D to be extruded at nozzle temperatures from 180 to 225°C and warns that the nozzle temperature should not exceed 235°C. A print speed of 80–100 mm/s and a nozzle diameter of 0.4 mm is recommended, and also a heated bed is desirable, set at a temperature of 60–70°C. In the absence of a heated bed, the use of double-sided tape is recommended to provide adhesion. 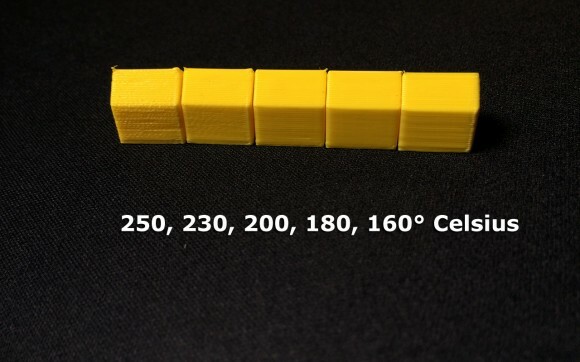 There are the settings that are recommended by the filament manufacturer, however we wanted to test things out getting outside of the guidelines to see how the Biome3D will perform on our MakerBot Replicator 2 printer. 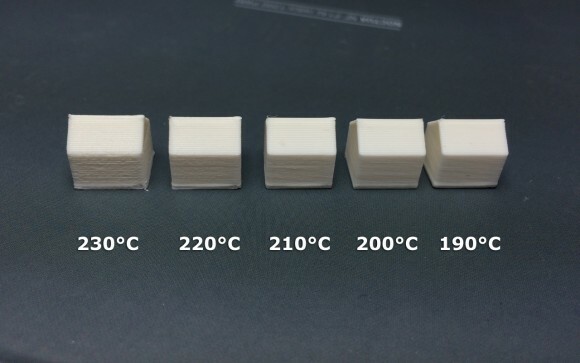 Since this material seems to be very similar to PLA we were actually surprised to see that there is a recommendation to use a heated build platform, even if it should be set at lower temperature. 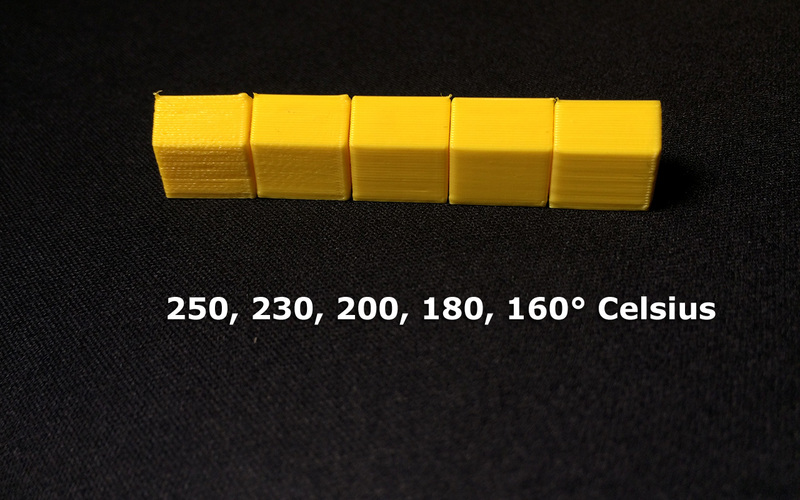 We have tried printing the Biome3D filament using the following extruder temperatures – 160, 180, 200, 230 and 250 degrees Celsius at the default extrusion speed that we use for PLA filaments of 90 mm/s and all of the prints were successful. They all were sticking well on the blue 3M painters tape that is used for the build plate by many people, there was no warping as expected, but we noticed that there was a difference in the level of quality we got at different temperatures. The best quality we got was at around 180-200 degrees Celsius, though the differences in quality are not that significant and even at 160 or 250 degrees C the prints are useable, just not looking that good compared to others. In our tests the Biome3D remains thermally stable at up to about 60-65 degrees Celsius, pretty much the same as with most PLA filaments. In the end the 3Dom Biome3D filament does seem a lot like PLA, behaves as such, and prints well without issues, we have noticed that it needs slightly more time to cool down as compared to PLA and this is probably the reason why slightly lower extrusion temperatures work better than with the normal 230 degrees C for PLA. We do like the Biome3D filament, the quality is good, the price is fine and it is currently available in 7 different colors – could be slight disadvantage, but still it could be a nice alternative to PLA filaments if you need only the more basic colors.